Want to learn how to read tarot cards? Not sure where to start? 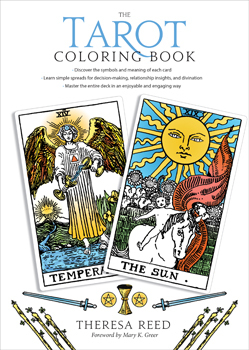 With The Tarot Coloring Book, you can color your way through every card in the deck - and go from "tarot rookie" to "tarot rockstar" in no time. Created especially for the growing number of new tarot enthusiasts, this book features illustrations from the classic Rider-Waite deck, jargon-free breakdowns of the symbolism and meaning of each card, and simple spreads for using the tarot as a potent and practical decision-making tool. Why does The Magician wear a red cloak? How come The Hanged Man has a blue shirt? Why is The High Priestess sitting between two columns: one black and one white? "In the tarot world, different colors represent different qualities and emotions," writes Theresa Reed. Now you can master the entire deck with a unique and enjoyable spiral-bound guidebook for exploring the hidden aspects of this classic divination system.